You Should Be Negotiating Rent on Your NYC Apartment. Here's How. As you may have noticed, it’s not exactly cheap to rent an apartment in New York City. As of March 2017, the average rent for a one-bedroom apartment was $2,711 a month. But factors like an influx of new developments and a continued demand for cheaper housing are causing prices to drop -- if only a little -- meaning potential renters may have more power over lease stipulations, broker fees, and concessions than they thought. In February, Curbed reported that concessions (like comped building fees or a free month’s rent) had hit an all-time high, with more than 30% of leases including an allowance of some type. Brooklyn, in particular, saw the number of concessions in a lease agreement triple from last year. That means there’s no reason you should be settling for the asking price on a rental without haggling a bit. 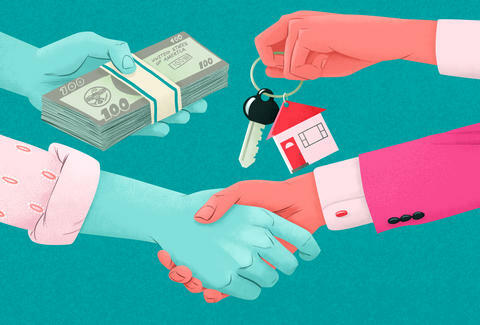 Figuring out how to negotiate can be tricky, so we asked NYC real-estate experts how to find money-saving incentives and lower rent on your next apartment lease. According to TripleMint’s director of agent development, Brian McFadden, current renters have the best chance of getting a break in rent on the apartments they currently live in. Because you already have a reputation with your landlord or management company -- and because your departure could mean a costly vacancy -- you’re in the best position to negotiate your yearly increase. “The size of the management company or landlord determines how much negotiating power you will have,” McFadden says. A private owner would much rather accept a lower monthly rent than absorb months of lost rent from a vacant apartment. “Certain [aspects] of the building or the apartment may be an invitation to a negotiation,” explains TripleMint agent Olgierd Minkiewicz. “Anything from garbage and recycling bins outside the bedroom window, a poorly maintained staircase, old appliances, crooked floors, or not-so-perfect water pressure in the bathroom” are windows of opportunity for potential renters to negotiate a lower monthly price. Renters with cash can sometimes sweeten the deal for a landlord by offering to pay a few months in advance or by putting down an additional security deposit in exchange for a lower monthly rent. Be careful (and realistic) when you’re negotiating your rent -- making a too-low offer can sometimes hurt a renter’s application. “There is always room for negotiation, but trying to get $400 off a $2,100 studio on the Upper West Side will most likely not be taken seriously.” Minkiewicz says. Landlords may not always be able to offer lower rent, but they’re often willing to incentivize renters with other perks. “Consider lowering your cost by requesting concessions from your landlord instead of actually changing your rent,” McFadden suggests. A landlord or management company may offer rent-free months, or comp standard add-ons like parking and gym access. He or she may also agree to pay the broker fee. Melanie Taryn Lieberman has lived in apartments all across Boston, Brooklyn, and Jersey City. She’s successfully negotiated move-in dates and new, stainless steel appliances.